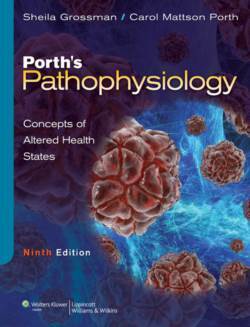 Featuring brilliant art, engaging new case studies, and dynamic new teaching and learning resources, this 9th edition of Porth’s Pathophysiology: Concepts of Altered Health States is captivating, accessible, and student-friendly while retaining the comprehensive, nursing-focused coverage that has made it a market leader. The book’s unique emphasis on “concepts" of altered health states, as opposed to factual descriptions of diseases and disorders, helps students grasp both the physical and psychological aspects of altered health. Drawing on the expertise of new co-author Sheila Grossman, the Ninth Edition maintains its comprehensive depth, while paring down content where appropriate and replacing descriptive content with striking art. (Approximately 600 illustrations are new or have been re-rendered in a consistent modern style.) Also new to this edition are advanced 3D narrated animations that address the most clinically relevant and difficult to understand disorders, engaging unit-opening case studies that reinforce critical thinking and set the tone for the content to come, and a wide range of built-in study tools. Now, for the first time, Porth’s Pathophysiology is supported by PrepU, an adaptive learning system that help students learn more, while giving instructors the data they need to monitor each student’s progress, strengths, and weaknesses.